Much has happened. The Smile Foundation wasn't interested in having us gather money for them through D&D. We played a session of our Gamemasters game, which ended with half the group leaving, which has led us to start up a new group with only a single DM. I've almost completed my latest adventure called the Kai Monastery, and we're getting close to starting up our 3.5 campaign again, which will begin on June 1st. This week, however, I want to talk about Session 0, since we're starting two new games within the next month. We ran a session 0 with the Gamemasters group, but it wasn't very successful. I often run session 0 to ensure a certain coherence within the group. For our new 5th edition game, our DM has linked us a youtube video about running a session 0. This guy presents the session 0 in a simple comprehensive manner and even provides a checklist, which I half expect our DM to use. 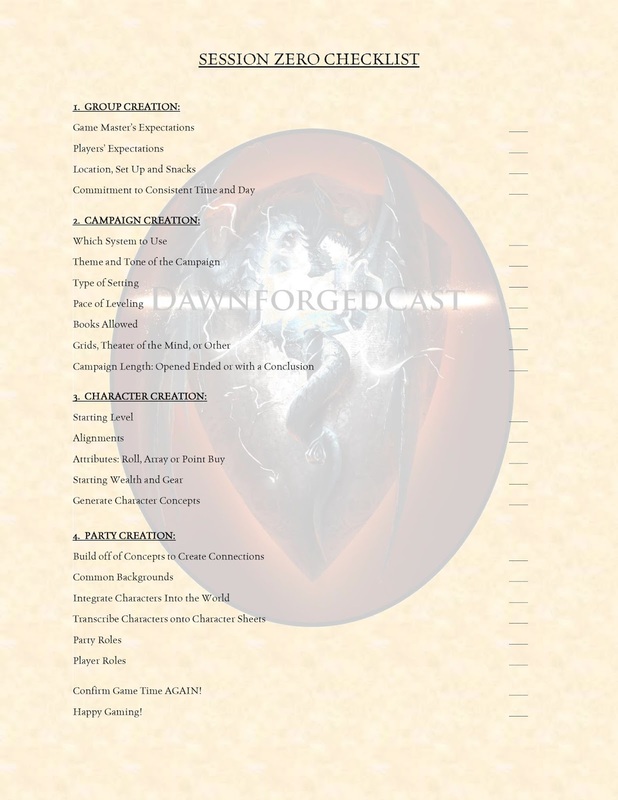 The checklist is divided into four sections: Group Creation, Campaign Creation, Character Creation, Party Creation. I'm quickly going to go through these points noting what we did at our Gamemasters Session 0 and what I expect to do at my own session 0 for my 3.5 game. Expectations - We agreed that we'd be running a 5th edition D&D game with changing DMs where each DM would run a 2-4 session long adventure. Our adventuring party would be tied together by an adventuring guild called the Order of the Black Phoenix. I'm sure we'll have a few things to discuss about our expectations for our 3.5 game. Location - Everyone agreed that we'd be playing at our place since we have a child that needs caring and attention. For our 3.5 game we'll most likely agree to play at one of the player's place and through Roll20. Time - We agreed to meet at 12:00 and eat lunch, provided by the hosts. We'd then play until 18:00 whereafter dinner would be served, again provided by the hosts. People would then head home latest 20:00. For our 3.5 game we're looking at playing a live game once per month that will go from 15:00 - 2:00 and then Roll20 games every other week from 20:00 - 23:00, but we haven't found a specific day of the week yet. 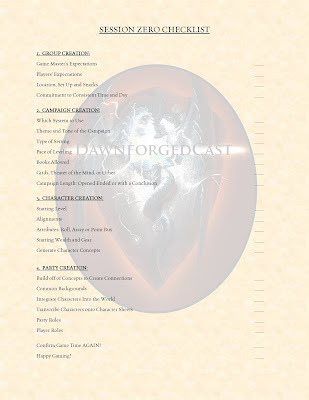 System - We agreed beforehand to run 5th edition D&D for our gamemasters campaign, and our 3.5 D&D campaign is a continuation of a previous campaign we ran. Theme - Our gamemasters campaign would be a series of small adventures. Unfortunately, we didn't discuss what aspects we would like to focus on. Many players preferred to play games about internal conflict and drama while others wanted to play puzzles and mind games. This is also a point we'll discuss a bit at our 3.5 game. I've created the adventure, but what are the players' expectations to the theme of the campaign? Setting - Our gamemasters campaign would have a varied setting that each DM would choose, but all of it would tie into the same world. The 3.5 game will be set during the end of the 3rd Age of my homebrew setting of Aspenta. Levelling - We agreed that in our 5th edition game we would use milestones and level according to the adventures we played. The 3.5 game still needs to be agreed upon, but I expect that we will run with the XP system I set into the adventure. Books - Apparently a majority of our gamemasters group disliked that we had books at the table, but it was never discussed. For our 3.5 game I expect that we'll run with heavy mechanics and books available. Grid - Each gamemaster would run his game as he wanted, while our 3.5 game will be using grids in Roll20 and live sessions. Length - For our gamemasters group we decided to run until each player had a chance to be a gamemaster, which would result in 6 adventures spanning 12-24 sessions, giving us enough material for 1 - 2 years. We also need to discuss our 3.5 length, but I expect it to last ½-1 year spanning 4-5 levels. Starting level - Our gamemasters game started at level 1, which our new 5th edition campaign also will do. The players for our 3.5 game already have characters, which they will simply continue to play with. Their average level is 11. Alignment - In both cases we decided to play without alignment. I'm looking forward to what our new session 0s will reveal on this point. Attributes - This was one of the points we went into depth with and wrote down our process. For our 3.5 game I mentioned that the players already have characters, so there won't be any rolling. Starting gear - We decided to run with standard starting equipment in our gamemasters game. Character concept - We talked about character concept at our Gamemasters session 0. I'm looking forward to going through character concept for our 3.5 game to get them refreshed. Party concept - Our concept was adventurers of the Order of the Black Phoenix, but half the players stopped playing with this concept a few sessions into the project. For our 3.5 game the concept is a group of adventurers who have crafted weapons that can defeat powerful elementals. All four characters are needed to defeat all four elementals (the fourth is an NPC). Background - Only my wife and I created a common background. None of the players for the 3.5 game have a common background. They don't even all come from the same world. They do have many adventures behind them though. Integration - It was each DMs job to integrate the characters into the world. For our 3.5 game, integrating the characters happened quite smoothly. Transciption - This is simply writing each character down on paper.